NANAIMO — A new year has begun and with it the toll of the mortgage stress test. In January 2019, 55 units were sold in Nanaimo at an average price of $544,902. That’s 38% less than the units sold in January 2018 but still maintaining a higher average sale price over January 2018. One of the main factors for this is the Guideline B-20 or mortgage stress test which has reduced some perspective home buyer’s ability to purchase by as much as 20%. 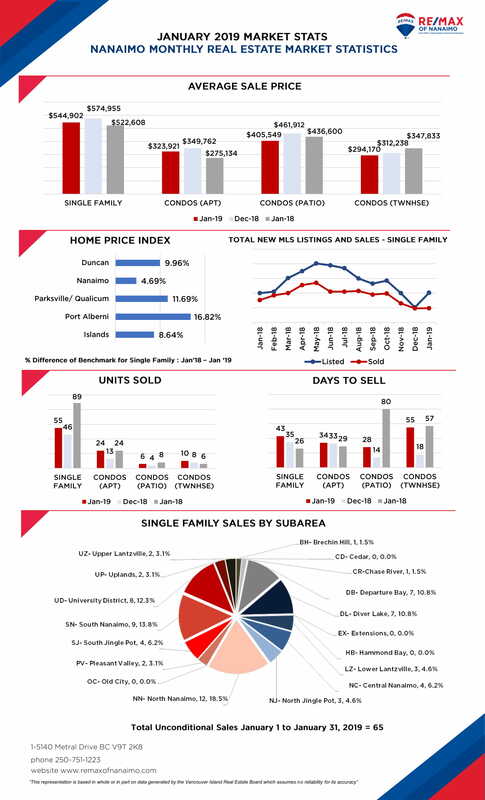 The single-family homes inventory for January 2019 rose by 32% throughout Vancouver Island compared to January 2018, and it climbed 5 percent from December 2018. But despite this increase in inventory, the average price of single-family homes year-over-year has continued to rise throughout the entire Island as well as in Nanaimo. It’s important for sellers to keep in mind that listing your home at 2016 or 2017 prices just isn’t realistic. The market in Nanaimo has nearly balanced and that type of market will force many sellers to realign their expectations. This of course means that buyers, for the first time in years, have more opportunity and room to negotiate.